There are 4 major ports to embark from on a blue cruise Turkey vacation. Each one offers different reasons for choice by travelers. In the Mediterranean of Turkey, guests can choose to begin their blue cruise holidays from either Gocek or Fethiye. Alternatively, the bustling harbors of Bodrum and Marmaris are quite popular as well. While both cities (Marmaris and Bodrum) are located in the Aegean of Turkey, there are various features that each city holds, that make embarking suitable to holidaymakers. Bodrum is an exciting city full of life, color, lights, sights – just simply a kaleidoscope of culture and entertainment. Located only 40 minutes from the Milas airport, travelers can enjoy a night out on the town nearby the harbor, prior to their spectacular journey of a blue cruise Bodrum holiday. The waterfront is lined with many of the most re-known bars and cafes. The views from the harbor are outstanding particularly at night. Should their be enough time – which is possible – visiting Europe’s largest open air night club might be a place to add to your list of must-see’s. Very impressive and certainly worth a brief or longer stopover. Another place of interest outside of the general shopping and promenade, is the Bodrum landmark; the St. Peter’s castle dating back to the early ages around the 15th century. This beautiful piece of architectural history was built by the Knights Hospitaller in 1402. Blue cruise destinations on Bodrum gulet cruises are offered from the Dodecanese islands; such as Rhodes, Symi and Kos with smaller islands in between. The same applies to the islands in the Cyclades where the most popular of islands to see are Santorini and Mykonos with again smaller charming little islands in between. Should your preference be to stay within Turkish waters, then alternatively destinations such as the Gulf of Gokova, and Marmaris as well as other smaller bays, town and villages. Custom itneraries can also be organized to cruise other wonderful and exciting destinations in the Aegean sea – all the way to Croatia – depending on the gulet. 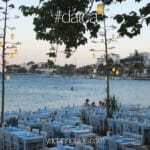 Marmaris is an altogether tale of gulet heaven. During the season, starting in mid April, all these lovely gulets start to come out of hibernation – or maintenance, and begin to line alongside the length of the harbor near the Old Town. Slowly the harbor side begins to liven up and creates the most striking display of classic Turkish boats and modern yachts. One of the most attractive features of Marmaris is the recently built Musical Fountain Square – only a 10 minute walk from the harbor. The performance goes on everyday from a little after sunset for 30 minutes. Hundreds of visitors gather around this grand water structure to enjoy its show of colorful lights and beautiful music. 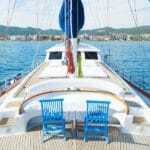 Should you decide that a blue cruise Marmaris is what you would prefer, then your itinerary choices are plenty. From one end of the Aegean all the way to the Eastern Mediterranean there are so many remarkable and stunning destinations to explore. Popular stops include the soothing mud baths in Dalyan and the ancient city of Caunos where you can hike up to see the impressive King rock tombs from the Lycians. Other places of interest can include the famous and most photographed beach in the Med, Oludeniz or otherwise referred to as the blue lagoon with its alluring turquoise shades of calm waters. While you are there you might even like to try paragliding from 1900 meters off Mt. Babadag. Itineraries that are pre-planned are meant for 4 hours of cruising per day, no matter where you embark from. However custom tailored routes can be planned where, should distances exceed a one week period of cruising time, travelers can easily book a gulet blue cruise for two weeks or 10 days. 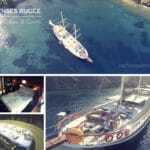 One other difference to consider is your selection in gulets for charter. Gulets that are based in Bodrum, may not embark from other harbors. This can be the same with gulets that have Marmaris as their baseport. However this does depend on the gulet. Sometimes during the season, a gulet, although based in Bodrum, may take a trip from Bodrum to Marmaris one way. 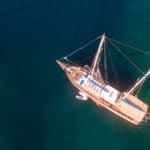 So that same gulet can be chartered from Marmaris to Bodrum. This subject is best discussed with your yacht charter agent. However the above just gives you an idea of what can be possible. Whether it is going to be gulet cruises Marmaris holidays or a yacht charter from Bodrum; you can be certain that you visit some of the most awe-inspiring gulet cruise destinations in Southern Turkey.